This year’s Academy Awards is generating several fascinating dilemmas. First up, could the Academy give the prize for Best Picture to a film as frivolous and patched-together as Bohemian Rhapsody? Let’s not even get started on the sexual harrassment allegations levelled at director, Bryan Singer. Secondly, what has everybody got against A Star is Born? Bradley Cooper didn’t even score a Best Actor nomination, let alone a shot at Best Director. The obvious response is: “When did truth ever matter in Hollywood?” In terms of travesties and lies I could reel off a long list of movies that have committed outrageous crimes against history (Inglourious Basterds?) let alone the reputation of a single man. Besides, the movie’s portrayal of Dr. Donald Shirley makes him seem rather more likeable than the ferocious snob revealed by his brother’s recollections. In recent years the Academy has rewarded movies that take a stand on social and political issues, notably race relations, and this is Green Book’s subject from start to finish. It’s an interracial buddy film, a road movie, a tribute to American popular culture circa 1962, and… a comedy. Along the way it veers briefly into the realm of homosexual stigma, and contains plenty of characters who seem to have stepped out of The Sopranos. There’s even a touch of My Fair Lady in the way Dr. Shirley tries to help out brutish Tony with his letter writing and his “diction”. 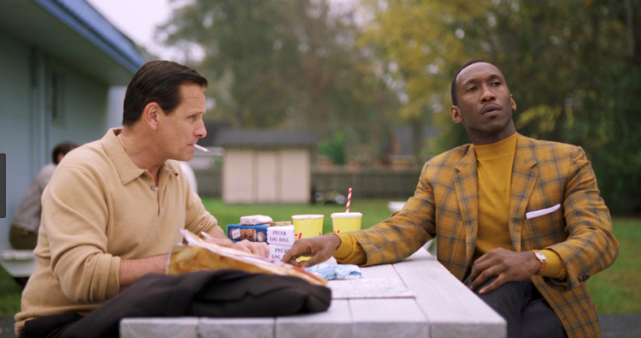 Green Book is a cinematic Bildungsroman – the German term for a novel of ‘moral and psychological growth’. The character that undergoes this evolution is one Tony Vallelonga, AKA. “Tony Lip”, a fast-talking bouncer from the Bronx, who is hired to drive Dr. Donald Shirley, a refined, multilingual African-American musician, on a concert tour of the southern states. Tony is a bruiser, perfectly at ease with his own abundant masculinity. Shirley is a dandy – a talented misfit forever separated from white society by the colour of his skin, and from the black community by dint of his musical and intellectual accomplishments. That’s the story in a nutshell, and every incident follows broadly predictable lines. We know the film will end when the tour ends, and both men return to their lives in New York. We know there will be issues as the elegant Dr. Shirley trawls through states where Jim Crow laws enforce an American version of Apartheid. This odd couple will meet violent rednecks and bigoted cops, but also men in dinner jackets who welcome Dr. Shirley as a performer but won’t let him use the restroom or dine in the restaurant. Tony is a denizen of the underworld who makes it his business to get on with everyone while trying to avoid involvement with the mob. Dr. Shirley is a famous recording star who performs to huge audiences, but retires to his hotel room every night with a bottle of Cutty Sark. Tony’s son, Nick Vallelonga, co-authored the screenplay, based on his father’s recollections, but as Tony spends the entire film boasting about being a champion “bullshitter” we can only assume that much of the story is fiction. As both protagonists died in 2013, the truth remains obscure, although Maurice Shirley’s claim that his brother never considered Tony to be a friend, merely an employee, puts a dampener on the feel-good nature of the film. The “Green Book” of the title refers to an actual publication that listed motels and restaurants where black motorists could go if they wanted a trouble-free journey through the south. For director, Peter Farrelly, known for intellectual masterpieces such as Dumb and Dumber (1994), there’s no doubt that Green Book is the highlight of his career. The screenplay is as smooth as Dr. Shirley’s touch on the piano, and the acting is first-class, with Mahershala Ali and a bulked-up Viggo Mortensen giving completely persuasive performances. Whenever the plot appears ready to crash headlong into cliché, Farrelly avoids the danger with a neat little swerve. It’s easy at this distance to be appalled by the institutionalised racism of the southern states in 1962, just one year before Martin Luther King would lead a 200,000-strong protest march on Washington D.C. The unspoken point is that many of these attitudes have never gone away and are now enjoying a resurgence. Green Book takes a soft-edged approach to the problem, showing how Tony’s racist views are modified by his close contact with the unorthodox Dr. Shirley. He in turn has a humanising influence on the rarefied sensibilities of his employer. The suggestion is that the abstractions and stereotypes of race can be broken down once we start treating each other as individuals. It’s wishful thinking, but one would have to be pretty hard-headed to denounce such sentiments. If Green Book walks away with the Oscar for Best Picture it will be a unifying moment in a divided nation, and just reward for an irresistible piece of filmmaking.